I developed my love affair with Nigella on a bright July afternoon while my bossy cousin, Madeleine, was being carried off by a giant Thrush. I was something along the lines of six years old and found myself exploring the wonderful walled cutting gardens of one of the Higgledy country piles, in sleepy Warwickshire. My enjoyment, however, was being cut short by my bothersome consort, who insisted on setting me straight at every turn. My laces were the wrong colour, which would result in freckles, my lack of French would see me to an early grave….and my grubby nails would ensure I should never marry….on and on went the girl. 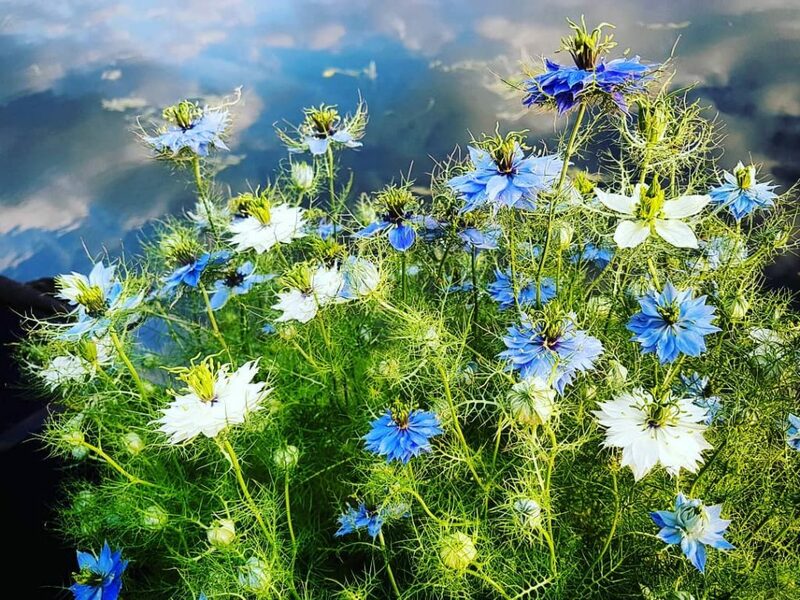 Happily, my attention was being seduced away from the vocal onslaught by my Great Auntie Bagsmith’s Nigella damascena. The label on the flower bed read, ‘Persian Jewels‘ and Persian jewels they indeed were. Deep ruby reds and Ocean blues, peculiar desert pinks and translucent lavender. These flowers were treasures indeed. I was focussing so intently on the blooms that I barely noticed the walled garden swiftly darken, and by the time I looked up all I could see were a pair of bossy jodhpurs being hauled across the blue sky by a huge and beautiful bespeckled bird. I still grow Nigella ‘Persian Jewels’ in my cutting patches out of respect for that avian ally. The second variety I am stocking this season is ‘Oxford Blue‘. This is for no other reason that it is a classic and that I also happen to be moored up on The Oxford Canal, where I shall be growing flowers for the summer of 2019. 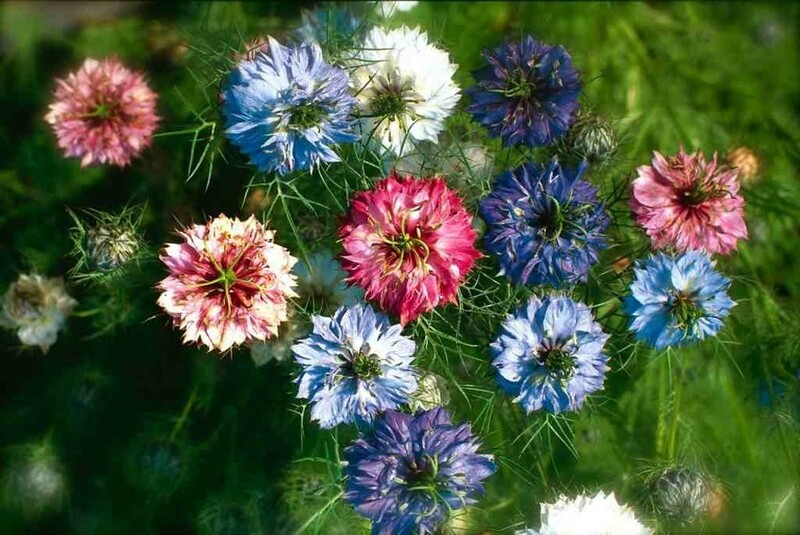 Nigella is a Hardy Annual and is super easy to grow. It is pretty much the only seed that I no longer sow in rows and instead sow reasonably thickly in a block. The flowers in the pic above were sown into a builder’s bucket full of compost, for the boat garden. I had a few rogue white ones…but I lived. The Sowing Of Hardy Annual Flowers In Spring. Aster ‘Ostrich Plume’. Are they from a parallel world? Callistephus chinensis.